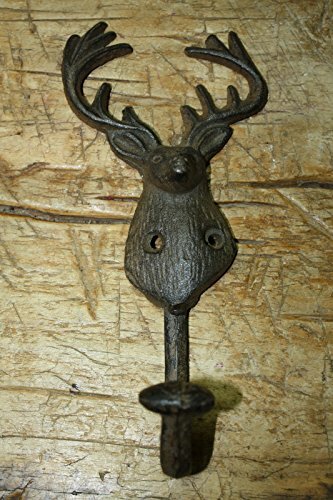 Starworld-Wall mount Cast Iron Antique Style DEER Towel wall Hook Coat Hooks Hat Hook Key Rack CABIN Hunting Camp Any Room decoration 8'' tallRustic Brown Finish by Starworld at Two Clock. MPN: Naive, Primitive. Hurry! Limited time offer. Offer valid only while supplies last. Description great cast iron coat hook. Made just like the hooks of the past. These have the same look of the antiques, but at a much lower price! great cast iron coat hook. Made just like the hooks of the past. Measure approx. 8" tall top to bottom, 3 3/4" wide, 2" from the wall to the front. This item has 2 holes for easy hanging. These do not include screws! Measure approx. 8" tall top to bottom, 3 3/4" wide, 2" from the wall to the front. This item has 2 holes for easy hanging. These do not include screws!